The 2018 season is over for the Baltimore Ravens, and it is time to begin the yearly roster evaluation. This year, we will go through all 10 positional groups and evaluate the state of each group, and make recommendations on what the Ravens need to change this offseason. In today’s article, we will take a look at the edge rusher corps. Here are the five edge rushers that were on the 2018 roster. There are two principle moves that the Baltimore Ravens will need to make this offseason. The first is to re-sign Za’Darius Smith, and the second is to decide whether future Hall of Fame inductee, Terrell Suggs, should return to the team in 2019. The former decision is the most important. Smith is a budding young talent at outside linebacker, and the Ravens need to lock him up with the money available in 2019. Determining Smith’s market value is a difficult proposition, as the market will be clogged with both productive veterans and youngsters. The Ravens could probably pay Smith $20 million over 4 years to keep him in Baltimore. After negotiating with Smith, the Ravens must decide whether to re-sign 36-year-old, Terrell Suggs. Retirement is rapidly approaching for the career Raven, and his tenure in Baltimore may end as soon as this year. If the Ravens re-sign Za’Darius Smith, keeping an aged Suggs on the roster would be very unlikely. The Baltimore Ravens have talent at the outside linebacker/edge rusher position. Matt Judon, Tim Williams, and Tyus Bowser are all under contract for 2019. If the Ravens construct a new deal with Za’Darius Smith, the edge rusher position will only grow stronger. A deal with Smith would automatically name him the starter opposite Matthew Judon, while Tim Williams is sure to get reps as well. Judon, Smith, and Williams all showed great flashes in 2018, and all three would constitute a high above average edge rusher group. If the Ravens are unable to re-sign Smith, Baltimore would need to add at least one free agent to fill the roster spot. Baltimore could re-sign Terrell Suggs for one year, or go after big-ticket players like Jadaveon Clowney or Anthony Barr. The Ravens could also add a depth edge rusher and hope Tim Williams or Tyus Bowser can make the jump to become an elite pass rusher. If none of these scenarios play out, the Ravens will turn to the draft. Do the Ravens Need to Draft an Edge Rusher? The Baltimore Ravens need to draft an edge rusher, particularly in the early rounds of the draft. Regardless if the Ravens re-sign Suggs, he will be gone within the next year or so. 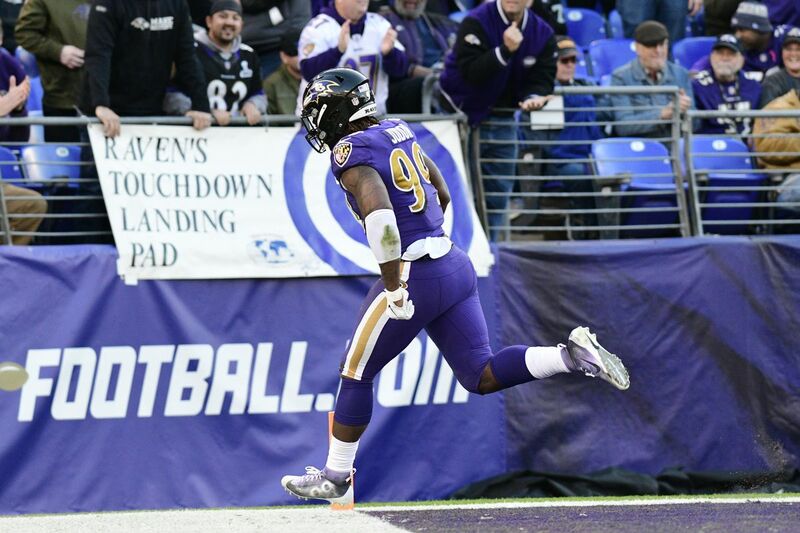 The Ravens also have not seen a lot out of Tyus Bowser in his first two years and might feel the disappointment in his production is enough to bring in direct competition to him. Tim Williams has shown his strength as a pass rusher, but the Ravens cannot rely on his presence. Williams has been oft-injured in his first two years with the Ravens. He only played in 15 games in two years. Finally, Ravens also have to prepare for the possibility of Matthew Judon departing after 2019. He will become an unrestricted free agent in 2020 and could be a sought after free agent. If the Ravens want to add a pass rusher in the first two rounds, Baltimore can target outside linebackers like Josh Allen of Kentucky or Montez Sweat of Mississippi State.